Lately, Sandy has popped in my mind. 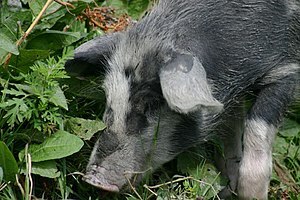 Sandy was a black and white pig with whom I had a childhood friendship. I saw him grow up since he was a baby pig. I have memories of conversations with Sandy; early in the morning I ran to his pen and talked to him. The funny thing is that he seemed to listen, or at least I thought he did – we had an understanding. One morning, I went to say hello as usual, but Sandy wasn’t there. I ran screaming to my grandmother, who told me he must have gone out at night. I believed her. The next day, I went to the local country store who was a few steps from home. I used to run there barefooted at times – out of childhood laziness. Since I knew the shop owner, I went thru the back entrance, sometimes. That day, I did. There, laying on the floor I saw my Sandy – he was dead, but I knew it was him. I started screaming and crying, and they had to take me home. They told me it wasn’t him, but I knew him well. Those memories are so alive in my mind, and as I write this post, tears are flowing. I write this post, first, because I realized that after more than 40 years, I have to let go of Sandy, and keep only the good memories. Second, to let you know that you may have your own Sandy (whatever that may be), that needs closure – even when you don’t know it, or have not known it for many years. If one day, you find yourself reminiscing about your own Sandy, don’t discard your memories as foolish, they popped up for a reason. Reminisce and take care of some doors that have been left open for years. Oil up the hinges and close them gently. As artists, we don’t know what may hinder our creativity. Today, as I write this post, I think of my beloved Sandy in a different way.